Welcome to the City of Brotherly Love! There’s no city like Philadelphia, Pennsylvania, which is a center of history and culture in the Northeast. Many of the best historical attractions in Philadelphia are free, so you can find them in our Free Things To Do section. However, there are still plenty of things to see and do in Philly! Visit the oldest zoo in America, run up the steps of the Philadelphia Museum of Art like Rocky Balboa, walk along the picturesque Boathouse Row in Fairmount Park, or visit the Benjamin Franklin Museum in the Old City district. Modern art lovers shouldn’t miss the Mural Mile Walking Tour, which allows visitors to see the Mural Arts studio and take a two-mile walk in Downtown Philadelphia to view notable murals. Travel back to 1776 as you tour Independence Hall, where the Constitutional Convention was held. See an original draft of the U.S. Constitution and more. Entrance is free but still requires a timed entry ticket to help prevent overcrowding. See the original Liberty Bell at Liberty Bell Center in Philadelphia. Plus, explore the Liberty Bell exhibit – all with free admission. Learn about the life and works of the literary genius, Edgar Allan Poe. You’ll discover how he influenced popular writers of today and also tour his home. You’ll be amazed by the more than 9,000 acres of land that makes up Fairmount Park in Northwest Philadelphia. Whether you’re having a relaxing walk, picnic or game of Frisbee, or embarking on a long hike or horseback ride, Fairmount Park is an awesome free public park. Valley Forge is famous as the Revolutionary War location where the Continental Army camped in 1777-1778. Enjoy hiking, biking and bird watching, or take a guided tour. Browse the halls of the Philadelphia Museum of Art, featuring works of art by renowned artists including Sargent, Monet, Renoir, and more. Free on the first Sunday of the month and Wednesdays after 5 p.m. Don’t forget to run up the steps like Rocky! You’ve seen it in movies and TV shows for years – now see it for yourself! Head to John F. Kennedy Plaza to see the famous LOVE statue, which was placed here in 1976. One of Philadelphia’s original squares, this is the park where Benjamin Franklin conducted his famous kite and key experiment. Franklin Square offers fun things to do for all ages. Lounge near the prominent fountain or take the kids to the top-rated playground. 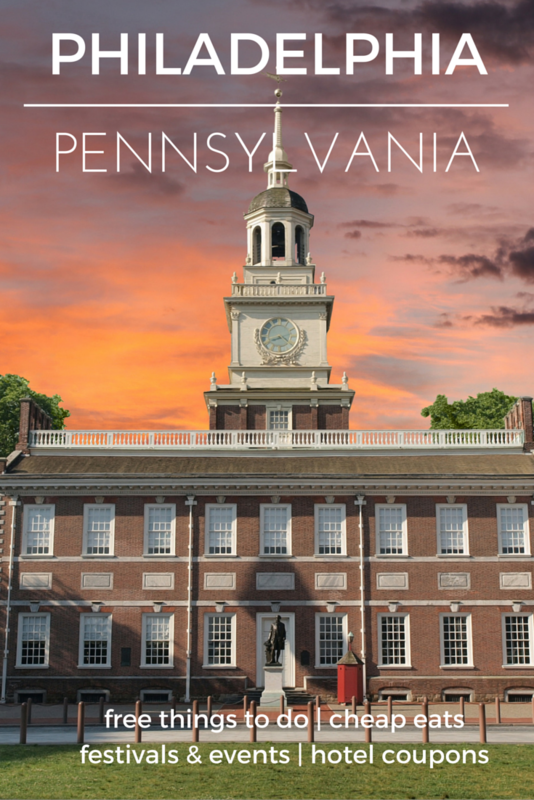 Congress Hall is located just steps from Independence Hall and is definitely worth visiting in Philadelphia. This is where George Washington and John Adams both became president. Plus, important government entities like the Federal Mint and the Department of the Navy were created here. Visit the popular Fireman’s Hall Museum in Philadelphia to see one of the best collections of firefighting artifacts in the nation. This museum is held in a firehouse that dates back to 1902.